L-M-J de 12:00 a 00:00. X de 19:00 a 00:00. Yo dias aleatorios y por las tardes de 19.30 a 21. De la cuenta no me acuerdo...vaya. La verdad que es interesante el tema este, tanto para eventos roleros, eso de tener tu propia base mola, como para darle algo de dinámica a nivel de flota con los ataques. You didn’t really think you could build a starbase and hostile forces would simply ignore it, did you? 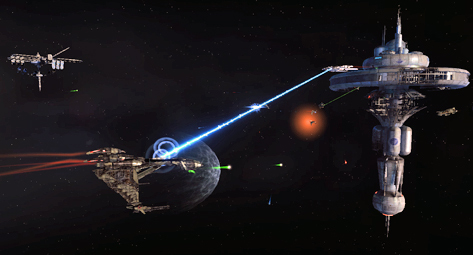 Occasionally, during the course of normal gameplay, players in a fleet will receive notification that their starbase is under attack. When this special kind of alert shows up, players have the option to queue up (via the alert itself) and defend their starbase. When the queue launches, players will be moved to their starbase along with other queued members of their fleet. You and your fleet mates will need to work together if you want to drive back the attacking forces. Starbase Alerts are similar to Red Alerts in that you must defeat a certain number of attackers in a set amount of time. If you’re able to do so, you have the chance to earn bonus rewards by defeating the captain of the invading force. The attackers are chosen at random with each engagement, so you’ll want to be sure you’re prepared for all possibilities. Low-level players can participate in these alerts, as they will temporarily have their level raised to 50 during the course of the event. Also, it’s important to note that participation in these alerts is completely optional, and there is no penalty for declining them or failing them. The only thing lost will be the opportunity to earn rewards. We’ll see you in-game and in the Starbase Alerts when they launch with Season 6: Under Siege.